Painter, part of an Austrian family of artists. Martino Altomonte was the son of Michael Hohenberg, a baker who had emigrated from the Tyrol to Naples, and it was Martino who changed the family name to its Italian form in 1684. 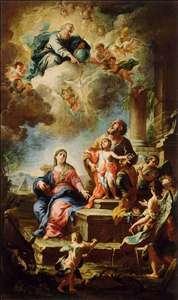 Martino and his son Bartolomeo Altomonte (1694-1783) both became celebrated for their decorative paintings in Austria, which continued the traditions of the Viennese school of late Baroque fresco. Of Martino s other sons, Franz Lorenz Altomonte (c. 1693-1765), an engraver, studied under Antonio Maria Gennaro (1679-1744) in Vienna. From 1727 he worked as an engraver at the Mint in Prague. Examples of his work can be found in the Kunsthistorisches Museum, Vienna. Andreas [Andrea] Altomonte (1699-1780), an architect, studied at the Akademie der Bildenden Knste in Vienna from 1726 to 1728. Another possible family member, Giacomo Altomonte (first half of the 18th century), was presumably related to Martino Altomonte as there is a painting by him at St Florian Abbey. He also produced frescoes and paintings for the churches of S Antonio (1721) and S Domenico (1722), both in Cagliari. Martino Altomonte (Johann Martin Hohenberg) was apprenticed at the age of 15 to Baciccio (Giovanni Battista Gaulli) in Rome, where he next studied with Carlo Maratti. In 1684 he was offered an appointment at the court of King John III of Poland and altered his name to Martino Altomonte. He travelled to Warsaw, where he produced paintings of royal battles and portraits (untraced) for the royal castle of Zlkiew (now Nesterov) near Lwow (now Lviv, Ukraine). It appears that he also painted a fair number of altarpieces. Of these, only the Sacrifice of Abraham (now Tarnw, Diocese Museum) survives, a work that reveals Altomonte as a follower of Neapolitan chiaroscuro painting. Between 1699 and 1702 Altomonte moved to Vienna, where he became a teaching member of the Akademie der Bildenden Knste in 1707. It was probably in connection with his admission to the Akademie that he was commissioned to decorate the Neue Favorita, an annexe of Schloss Augarten. The few surviving oil paintings from this period, for example Susanna and the Elders (1709; Vienna, Belvedere), show the strong impact of the Neapolitan painting of Luca Giordano and suggest Venetian influence as well. Altomonte developed a mixed Neapolitan-Venetian style that incorporated the illusionistic architecture of Andrea Pozzo and created a style that set the standard for Viennese Baroque painting. In his oil paintings he scattered Venetian pastel tones among dramatic elements of Neapolitan chiaroscuro. In 1709-10 he worked on ceiling paintings for the archbishop s Residenz at Salzburg, and about 1710 he became imperial court painter. He also produced altar paintings in Vienna for the Dorotheerkirche (1713; now in Rheindorfer Parish Church), the Peterskirche and the Stephansdom (both 1714) and for the parish church in Krems and the Deutschordenskirche in Laibach (now Ljubljana, Slovenia; both 1715). In 1716 he painted the ceiling frescoes in the Lower Belvedere in Vienna. 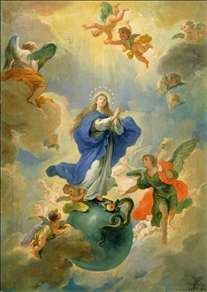 See more details about "The Immaculate Conception"